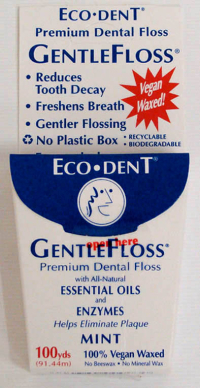 Item #0236: Dental Floss (they call it GentleFloss) that is better for your teeth and your planet! No beeswax, no mineral wax. This floss is vegan with a blend of 14 essential oils and lacto-peroxidase enzymes. And just as great, there is no plastic box to end up with the other 9+ million pounds of wasteful packaging that go into our already overly-crowded landfills each year. Only EcoDent offers you an alternative to dental floss packaging waste. Not just ecological, economical too! Each recyclable, bio-degradable paper package contains over 100 yards of floss.